We have 19 days until the end of the legislative session, and how have we spent the month of May so far? We didn’t meet at all during the first week, and this past week was spent passing resolutions and making “points of personal privilege”. We didn’t vote on one bill, and didn’t go anywhere near talking about getting a budget. We were supposed to be in Springfield all week, but Friday session was cancelled. 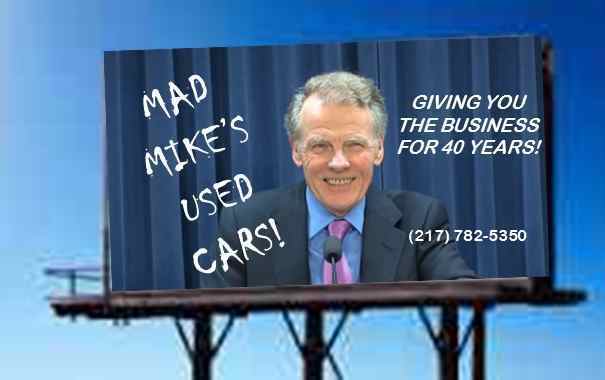 This entry was posted in Illinois Budget and tagged Budget, General Assembly, Illinois Budget, Michael Madigan. Bookmark the permalink. 3 Responses to Frustrated? Call (217) 782-5350. Ask for Mike. Would a Constitutional Amendment through public vote be possible method to establish a (2.5%?) property tax rate cap in Illinois? Such action seems plausible, given an Amendment recently passed in order to divert money from public safety spending to road construction special interests. What would you need us to do? Petition with 8% of gubernatorial vote signatures? Would you devise the header of petition? I believe a constitutional amendment would be possible, but watch what you wish for. There could be unintended consequences, much like we have with the pension guarantee. When Massachusetts passed “Prop. 2-1/2”, it was embodied in statute, not the constitution, which gives flexibility not available when a change is made to the Constitution. Of course, it requires discipline on the part of legislators and local officials to stick to the program, and discipline is something we’re awfully short on around here, but I think to go slow and advocate for something in statute, such as what I’m proposing here, is the better way to start. So what? There are consequences to status quo which are unacceptable–even devastating– to many Illinois non-insider citizens. Why should boogie man unintended consequences be any scarier than what we are facing today? To paraphrase the immortal wisdom of N. Pelosi: we have to pass it to see what it does. Or perhaps maybe the mere credible threat of such an inflexible barrier to status quo access to public tax dollars might spur actual movement on a statute? A better way to start is only better if it starts.